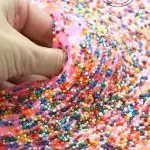 Microbead Slime Recipe Without Borax – a fun sensory slime with clear glue for perfect beaded fun. When it comes to making slime, we sure make a lot of it. Even when I am not making it to give you slime DIY and inspiration here, my kids are making it and stacking the counters with endless slime bowls and zip bags full. For some reason, it just never gets old. 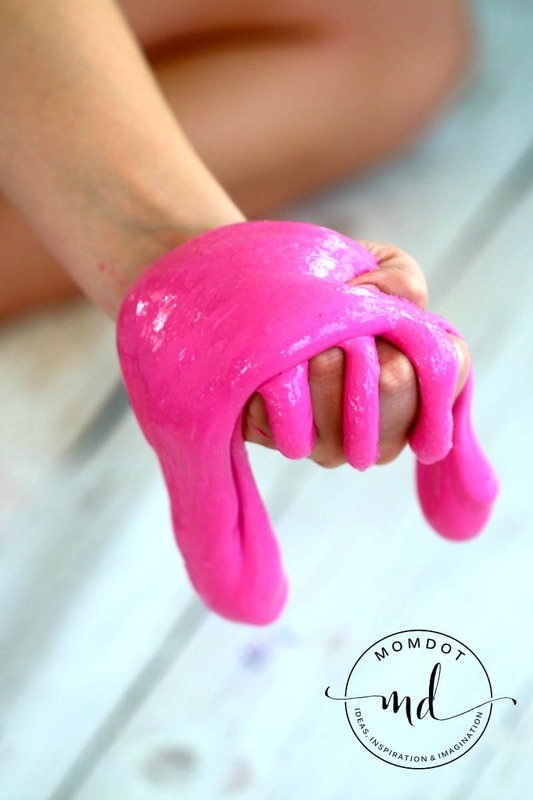 From fluffy slime to unicorn poop slime, there are so many slime recipes on MomDot you may be missing them all. But we do make a lot of slime that includes white glue in the ingredients. The main reason? Its easy to get. 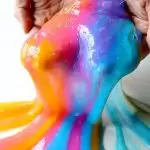 It comes in a gallon size and it can be dyed so many beautiful colors of the rainbow (slime). Except then I walked into the store and saw this: CLEAR GLUE IN A GALLON BOTTLE! Let me warn you, this is not a product that is in plentiful supply. At the time of writing this article, there is literally only 8 bottles on Amazon. Of course you can always grab the 16 oz which is atleast 4 bottles worth, but get the gallon if you can like ASAP. I love clear glue in slimes because honestly its just so darn gross. It reminds me of the old Ghostbuster’s movies where gunk was dragging down the wall. Click below to see if its available – if not try here. NOTE BEFORE WE GET STARTED: First when it comes to slime, please know that its a science project. It shouldn’t be done with really tiny children or kids that put things in their mouths. Maybe goop or dyed spaghetti is better for the little’s. At the end of the day, slime is a fun project but also one that you should create with caution. 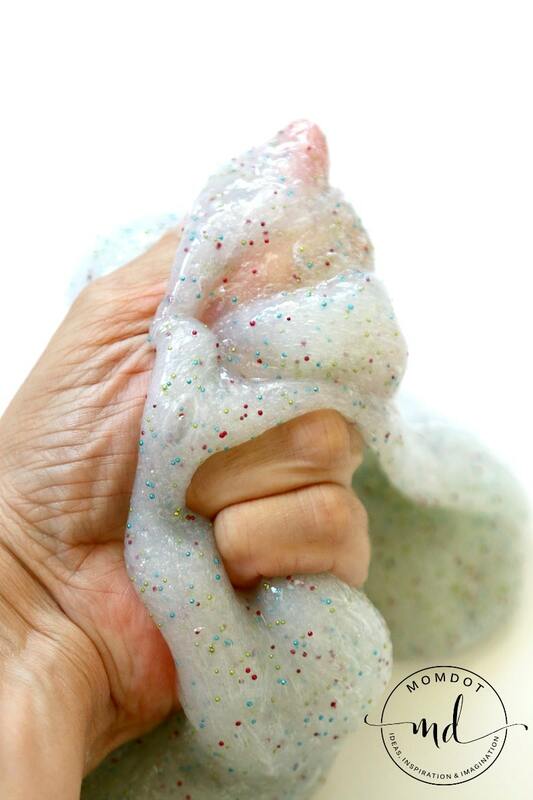 Second you need stuff to get started on this microbead slime. Supplies are paramount! Being prepared is a must before any project as getting half way in between and realize you are missing something is un-fun. 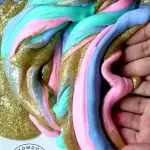 I also recommend these supplies because its what I do to create such pretty slime, so I wouldn’t say use any substitutes for this unless you are really experienced. Personally, I buy all my supplies on Amazon for a few reasons. One, finding this stuff, while not uncommon materials, can be super hard. Glue , and this clear glue in particular, is in a shortage everywhere due to kids making slime! Liquid starch is also not at every store. I also have done some experiments and the colorant I listed below is hands down the best for projects where you want some color pop. You still need the traditional slime ingredients. For us, that is a Gallon of Clear Glue, Liquid Starch , and of course, the beads. Before you ask, yes you can use a fluffy slime recipe for this and add shaving cream, but it will alter the color of your slime so I left it out so we could see the beads. I got these in the glitter section of the craft store. They are not that cheap, so you are just as good buying them online and getting a variety of colros for your slime fun. Here is an option or if you prefer, Martha Stewart has a pretty cool set here. Get your BEAD EXPLOSION ON! All this talk on fluffy slime. While I love fluffy slime, this is not it. This is your traditional awesome slime recipe. 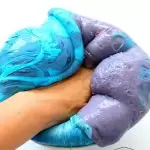 If you want to make fluffy slime, you can alter this recipe by visiting HERE and then see what to add. 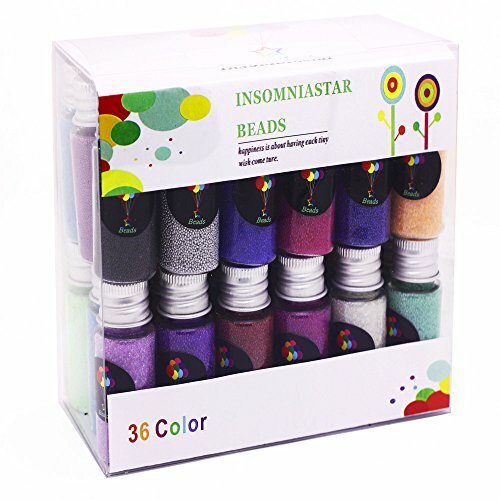 Just note that it will change the color of your slime and you may not be able to see these beads or any other unique glitter you add. 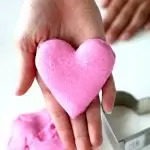 If you want to learn how to make slime without borax, go there. As far as creating slime, there is no right or wrong way. It literally depends on your glue to starch ratio. I start with about 2 cups of glue per color so its nice and thick. Now its time to take your glue and make it into slime! That happens when you introduce liquid starch in. Pour in approximately 1/3 liquid starch and stir till it starts to combine. Then you will need to KNEED it like dough to thicken it up. If the slime is stills ticking to your hands, it needs more starch. CLEAR GLUE NEEDS MORE STARCH THAN WHITE GLUE. You may need as much as 1/2 a cup or more depending on your glue. Add a bit at a time and knead until it forms and stops sticking to your hands. This will take about 3 minutes, maybe longer depending on how big of a batch of slime you need. 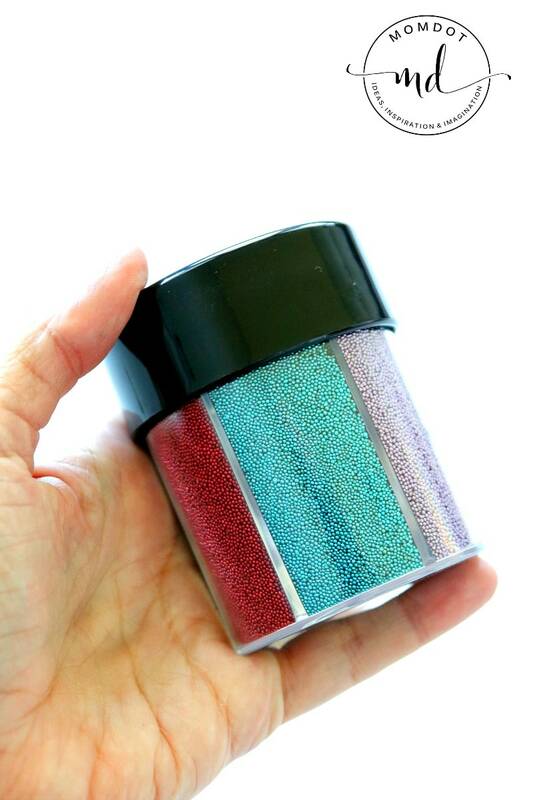 Add your beads – its also fun to add some fine silver glitter! 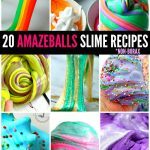 Love this slime recipe? You must check out this goopy amazing bat poop slime, perfect for Halloween slime recipes and this super fun star slime which has melting sprinkles! I start with about 2 cups of glue per color so its nice and thick. Now its time to take your glue and make it into slime! That happens when you introduce liquid starch in. Pour in approximately 1/3 liquid starch and stir till it starts to combine. Then you will need to KNEED it like dough to thicken it up. If the slime is stills ticking to your hands, it needs more starch. 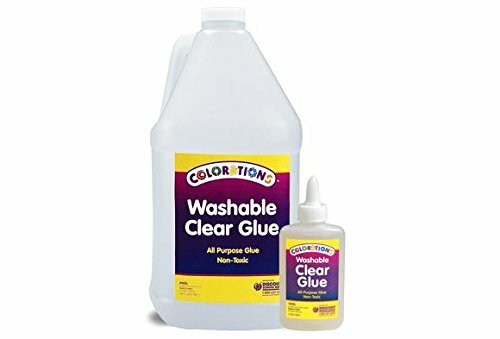 CLEAR GLUE NEEDS MORE STARCH THAN WHITE GLUE. You may need as much as 1/2 a cup or more depending on your glue. want to see how slime is made? 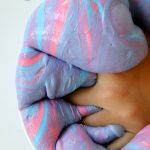 This short video will give you the skinny on making slime with glue and starch and how unbelievably easy it is! I hope this inspires you to get your slime made! This video is a longer video that shows you how slime comes together. 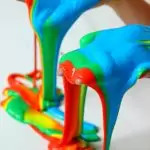 Many people believe that slime is instant but it can take some time to mix up and kneed. This video will help you understand what you are doing wrong- OR right! Making bubbles is SO much fun with slime! Learn how to make bubbles alone or with a friend. Who can make the biggest bubble? We experimented with creating a kinetic slime that sticks together. Come see how we did it! I just LOVE how this turned out! So pretty! I never would have thought to use microbeads!